This 6"x6" decorative tile is hand glazed on authentic Italian red quarry tile and kiln fired at over 1,850 degrees creating a durable, stain resistant, weatherproof and fade-proof quality piece of art. All of our tiles are lead free, non-toxic and packaged with recycled materials. 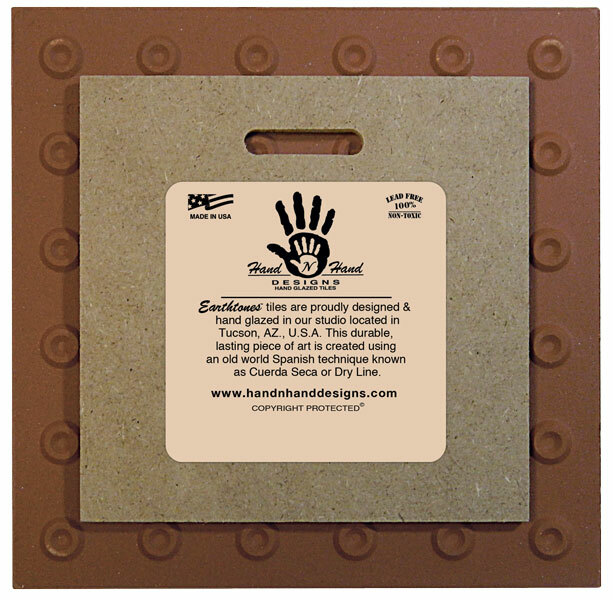 Our tiles are heat resistant and can be used as a trivet/hot plate. Great for indoor and outdoor uses. Every 6"x6" tile is backed for protection of furniture/countertops and includes a slot making them ready to hang as beautiful wall décor.